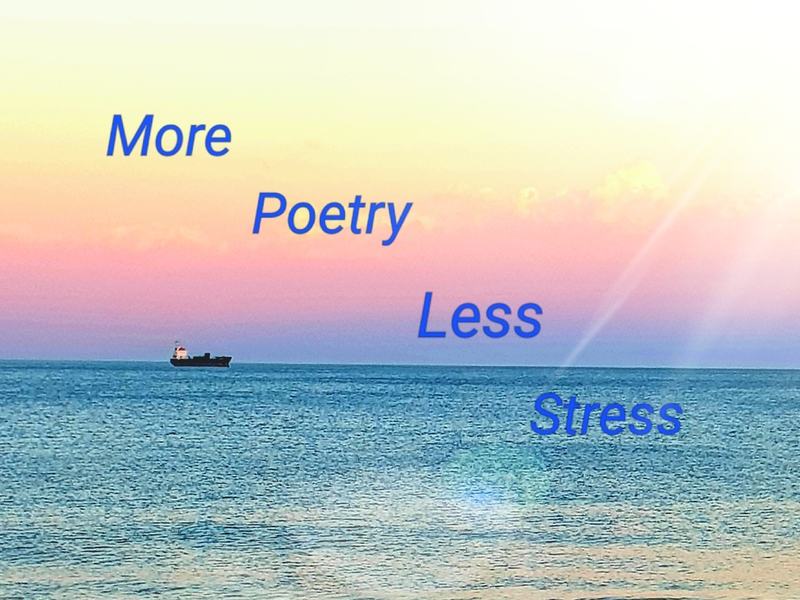 This Tanka is for Colleen Chesebro’s challenge. This week we are using synonyms of ‘bewitch’ and ‘treasure’. Picture taken in the Hall of the Hotel Real in Segovia, Spain. 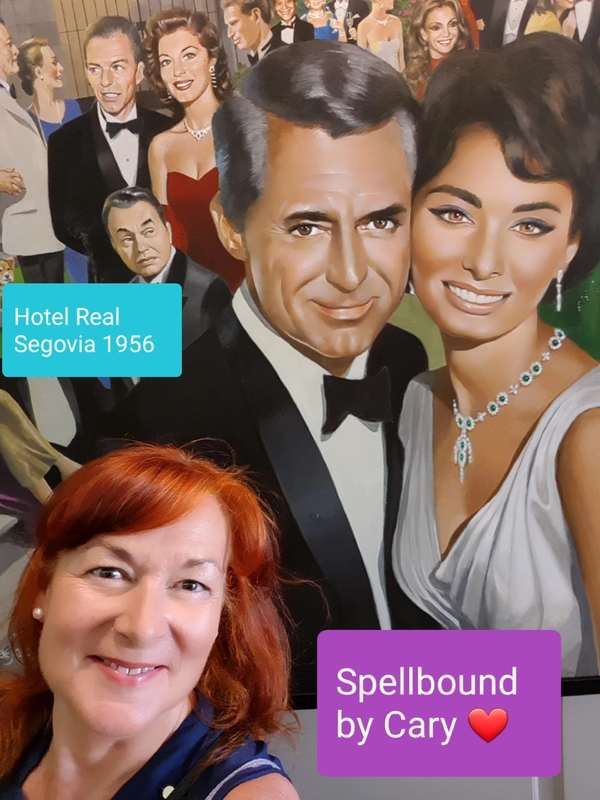 Cary Grant, Sophia Loren and Frank Sinatra, among others, stayed at the Hotel Real in Segovia, Spain, in 1956, while filming The Pride and the Passion (1957). Cary, who was married at the time to Betsy Drake, fell in love, or lust, with Sophia during the filming, but she was in love with Carlo Ponti, whom she married shortly after. Rumour has it that Cary continued to pursue Sophia during subsequent films in which they co-starred, but Sophia is said to have rejected him every time. I didn’t know about any of this when I arrived at the hotel, I hadn’t even planned to stay in Segovia. It was a last minute decision on my way home to Cordoba. 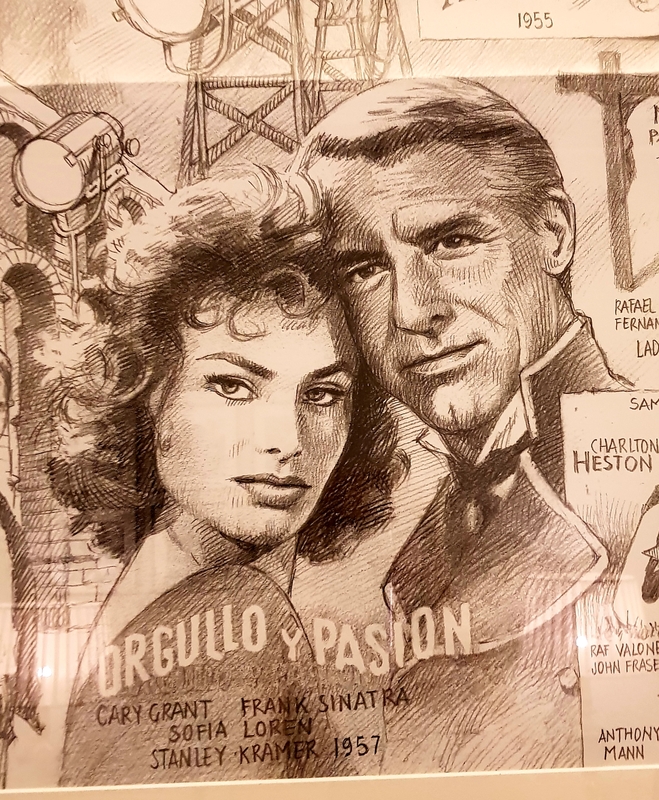 I was naturally thrilled to find so much memorabilia in the hotel and to imagine that these two actors walked along the hall, perhaps up the stairs, and looked out over the roof top terrace to see the very same view of the city I saw a few days ago. 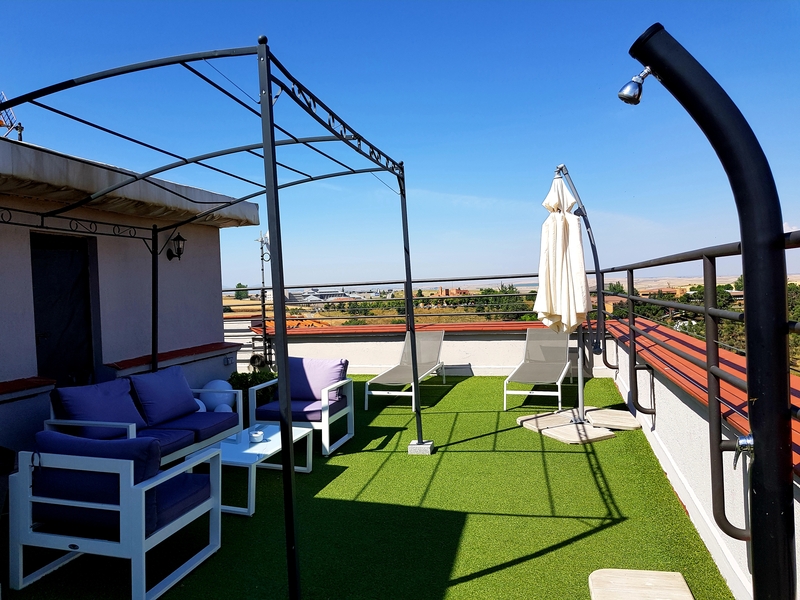 Rooftop, solarium at Hotel Real, Segovia. I’m aware thar Archie Leach was far from a perfect gentleman, but Cary Grant will always be my favourite actor, because I’ll never tire of watching Charade, North by Northwest, My Cousin Rachel, Notorious, To Catch a Thief... all unforgettable. 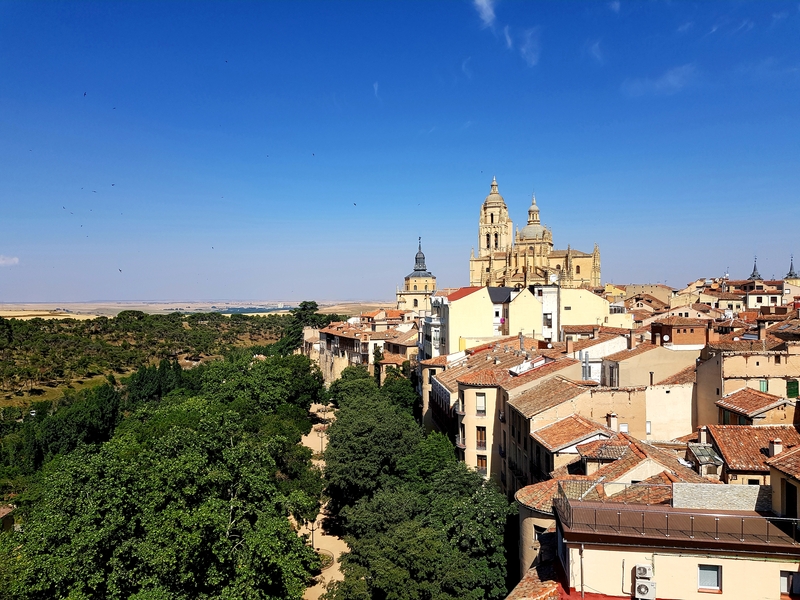 By the way, Segovia is a magical city and I’ll be posting more pictures of my visit tomorrow on ‘Sunday Walks’. I actually did know that. My mother was a buff and I never missed a Sofia Loren Cary Grant or Bogie movie. I loved them all. And I got to see a bit of your lovely country to boot! Weren’t they a great movie couple? In fact Cary was a great ci-star on film at least. He was great with Ingrid Bergman, Audrey Hepburn and Grace Kelly too! OMG I love Carey Grant! He was all the things you said. I haven’t seen all his movies, but I loved North by Northwest, Notorious and To Catch a Thief! How fun that you were in the same hotel as these greats! Yes, it was a wonderful surprise! Really? I had no idea. I was under the impression he pursued and she wasn’t interested, but what you say makes sense. A married man on his third marriage, she’d have been his fourth, didn’t offer her much security. I’ll look up that interview. Thanks for letting me know! Edoardo even joked that Cary Grant was almost his father. LoL!! You’re welcome. Wouldn’t it be wonderful to travel around the world and write about it? My ideal job! One of my favorite all time actors as well. I dreamed of meeting someone like him. Beautiful tribute. Screen idols are hard to find in real life! But there are advantages; they don’t age or let us down, and we can watch their films as often as we like!